Have you ever pulled out a loaf of bread to make yourself your favorite sandwich, only to find that the slice you pull out has been infected by little bluish or white blobs? You may recognize those blobs as mold and can toss out the loaf before it poses any real harm. However, did you know that your bread bag isn’t the only place mold can grow in your home? In fact, there are several places in your home that are susceptible to mold growth that you may not even know about. Below, gain a better understanding of what mold is, how it can harm you and your household, and the top five places it may be hiding in your home. 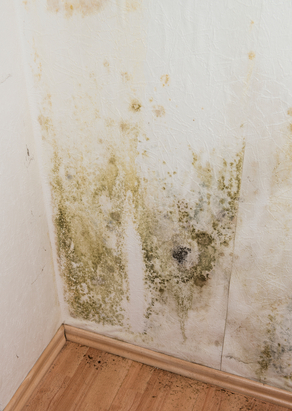 Mold is a fungal growth that can appear as a result of water damage or excessive moisture in your home. Sometimes it is visible and can appear many colors such as blue, green, black, or white, but often it is not even visible to the naked eye at all, and can also be hidden within the walls, floors, and ceilings of your home. Oftentimes, mold produces a strong, musty odor that can lead you to where it is growing. Not only is mold gross to look at and smell, but it can also pose a threat to your home and the people in it. Serious health issues may arise from mold, especially airborne mold, and can wreak havoc on the respiratory systems of those in your home. It becomes especially dangerous for those with weak immune systems or allergies, and can even land you or someone in your household in the hospital if not properly detected, professionally tested, and taken care of. In addition, mold can structurally compromise your home and damage furniture, wood, carpet, insulation, and much more. basement, the spores are most likely to spread throughout the rest of your home with the rising heat. mold could be thriving in your bathroom off all that excessive moisture. The most difficult to detect and yet the most dangerous molds can often be found inside your ceilings and walls. been affected by moisture or water damage, it wouldn’t be a bad idea to have your home professionally mold tested. in the Bella Vista area, you can call Courtesy Care at (877) 690-7978 for all your restoration needs.